Since 2003, I have transformed corporate strategies using digital marketing across the following industries: Advertising, Art, Fashion, Food & Beverage, Technology, and Finance. Most recently I was the Vice President of Digital Marketing for JPMorgan Chase & Co. I have a Master's Degree in Marketing from NYU and a BA in Communications from Pratt. I'm a certified teacher by NY State. I teach Digital Marketing at General Assembly and at NYC Business Solutions. I help businesses of all sizes get to the first page of Search Engines. Most SEO companies won't tell you what I'm about to tell you: you won't get to page the first month after signing up for SEO. And I will never guarantee page one rankings in the first month. It's not ethical because no SEO company has control over where Google, Yahoo, and Bing rank your website. If any SEO company promises to get you to page one in a month, they're either lying to you or they're practicing Black Hat SEO. I will guarantee that my team will do outstanding SEO work and everything in our ability to get you to page one as soon as possible. Typically this takes between 3-6 months. However, I have seen clients rank in their second month. It all depends on your competition and how many hours of work you dedicate to building backlinks. I love working with small business owners. They're aggressive and they like to move quickly. I do too. Tell me a little about your business and I'll give you a call so we can talk about it. Or call me at 917-231-4369. What are your top three competitors and the three keywords you want to rank for? We achieve results - 92% of our clients have received page one ranking within 3 months. Complete transparency - access your online dashboard to view our work. No contracts - if your budget changes, you can pause or cancel at anytime without any fees. Reasonable rates - we only charge $40/hour, which is a very reasonable rate for NYC. We're based in the US - we do not outsource our work. Highly skilled professionals - our experts are certified and tested before they're hired. Who is the best SEO company in NYC? I'm the number 1 best SEO Agency in NYC according to Yelp. 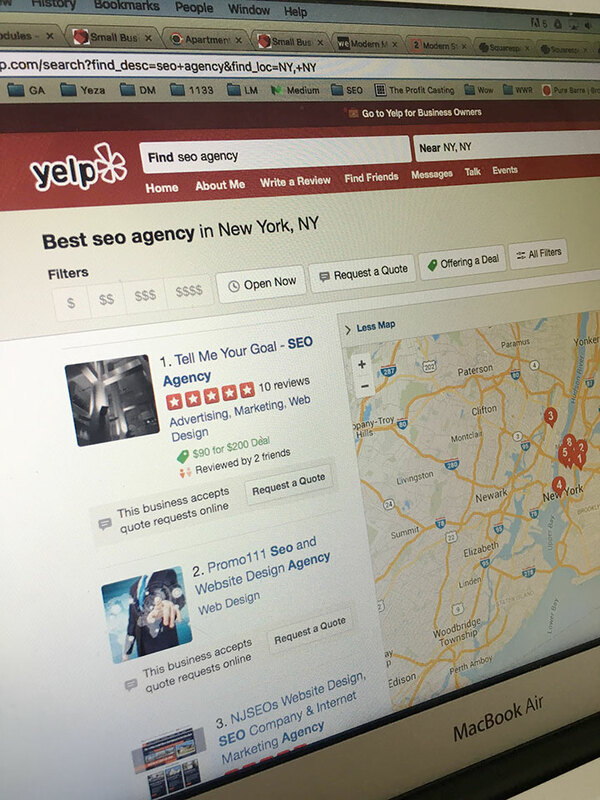 Go to Yelp right now and type in "SEO AGENCY" and search in "NY, NY". I show up in the first position because I have more five-star reviews than any other SEO agency in NYC. There are currently 87 SEO agencies in NYC. If you look closer at them, you'll notice that each one has very few reviews and they don't have any references to give. I don't know about you, but when I'm looking for professional services like a doctor or a lawyer, I want to call those with perfect reviews and lots of references. I have both. And I also teach on the subject of Digital Marketing. You have to ask yourself if the other NYC SEO agencies can't get themselves to the first position, why would you trust them with your business? I will provide you with three references that you can call and ask about my level of service and the results I helped them achieve. Just ask me: 718-915-3911. SEO can and should be the largest contributor of revenue to your business. Organic search should be the source of 75% or more of your traffic. If it's not, you need help. Why would you waste money on ads? Once you stop paying, the ads disappear and you stop receiving traffic. With SEO, once you get to the first position, you're more likely to stay there. This graph shows the comparison of SEO to other marketing channels such as Social Media. SEO has the highest conversion probability and the highest prospect quality as compared to any other marketing channel. If you're on the first page of Google, Yahoo, or Bing, you will receive huge increases in traffic to your site. And you will increase your revenue. Why? Because the conversion probability and the prospect quality are the highest for organic traffic because customers are actively typing in your product or service. They're looking for your business. Conversely, ads are disruptive; you're essentially yelling at strangers who may or may not be looking for your business. What does conversion probability mean? People are actively searching for the term that you're ranking for. For example: if I'm searching for "30 inch round weber grill", there's a good chance that I'm about to buy that grill today. That's why I mean when I say conversion probability: it's a measure of how likely someone is to take action or purchase something from your business. Take a look at that graph again. Why do you think that social media does not have good conversion probability? It's because of the user's behavior. Think about the last time you were using Facebook or Instagram. Chances are that you were on your phone. Where you interested in buying something when you were interrupted by an ad you saw? Probably not. That's why the conversion probability is low for social media. People don't want to be interrupted. They're on social media to connect with friends, look at memes, and share their experiences–not buy. But when they're searching for something on Google, there's a much better probability that they want that thing and they're about to buy it. 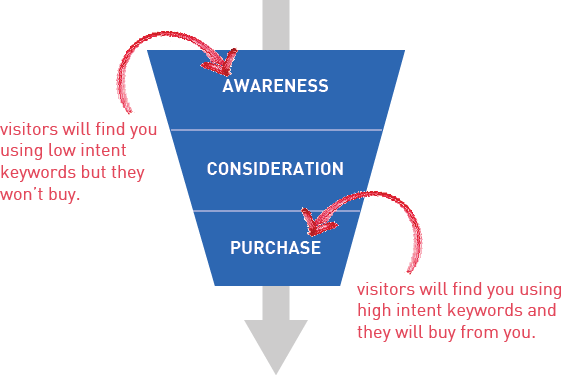 This chart compares low intent with high intent keywords. Low intent keywords are broad; they indicate that someone hasn't done their research or is currently doing their research. This type of person isn't likely to purchase from you. On the other hand, someone that is searching for something very specific has likely done their research and is ready to purchase or contact you. Although you may get a lot of traffic for low intent keywords, the conversion probability will likely be very low. On the other hand, if you target high intent keywords, the volume will be lower, but visitors will be more likely to convert. Therefore, you want to focus your energy ranking for the high intent keywords. What does prospect quality mean? Have you ever judged how likely it is that a customer that just walked in to your store will buy something? Perhaps they just didn't look or act like your typical customer. And when they turned around and walked out after not purchasing anything, you were proven right. That's prospect quality. Prospect quality is a measure of how closely a visitor matches your ideal customer, which is a great indicator of how likely it is that they will purchase from you. You want the RIGHT customers to visit your website. That's precisely why getting on the first page of Google is so important: the right customers are searching for your products or services in that very moment. They're ready to buy. And if you're not on the first page, they're going to buy from your competitor who is on the first page of Google. If you don't want that to happen, give me a call right now: 917-231-4369.